From the moment you were old enough to understand relationships and from observing how your parents behaved around each other, you might have already developed your own concept of what an ideal marriage is like. As you grew older and matured, your experiences with dating and romance has perhaps helped you acquire a more realistic mindset on how real marriages operate. As a result of this, it has enabled you to understand the gravity of making the decision to get married. For most people, marriage is not a subject to be taken lightly and requires a tremendous amount of hard work and commitment. In most cultures across the world, the union between two persons is considered sacred and an important milestone in the couple’s life. As such, it is of great significance that you find the most ideal partner before deciding to wait at the end of the aisle for her. For a lot of men, one of the most ideal partners to have are Ukraine women because of all the many appealing qualities that they possess. The local women in Ukraine are known for being agreeable, smart, hospitable, and having natural good looks. Due to their traditional upbringing, the vast majority of Ukrainian ladies are family-oriented, religious, and marriage-minded by nature. Their nurturing character makes them an ideal best friend, wife, and mother to their families. As a result of this, it comes as no surprise that a high percentage of the tourism within the country can be attributed to foreign men seeking marriage with single Ukraine women. This is most evident in the popularity of companies that offer the best Ukraine marriage agency services, with hundreds of men and women signing up for their assistance. The popularity of Ukrainian ladies in the international dating scene is not a well-kept secret though, as their distinctive characteristics makes them one of the best partners to have. To learn more about this, discussed below are the reasons why these women make the best brides. 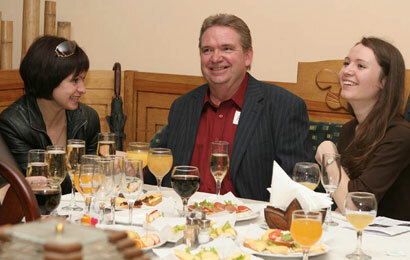 Discover how to meet women in Ukraine through our romance tours. Ukraine women are notorious for having stunning good looks, which are often completely genetic. When you roam the streets of Kiev or Odessa looking to date Ukraine women, you can easily observe that there are hardly any ladies that have undergone plastic surgery of any kind. Aside from their genetics giving them natural good looks, their appealing appearance can also be attributed to being health-conscious. These ladies are known to take part in skin care regimens, proper diets, and regular exercise too. In a more traditional sense, Ukrainian ladies are usually brought up to be the hostesses of their households. Due to this, their interests naturally lean towards being an ideal homemaker for their families. This generally includes preparing meals and beverages, entertaining the guests that arrive, and even organizing events for their friends and family members. As such, if you are someone that enjoys dinner parties and get togethers, a Ukraine bride is the best partner to have because it ensures that your guests are entertained and comfortable during their visit. Due to Ukraine’s troubled past and the oppression that its people experienced preceding their independence in 1991, its people know what it’s like to work hard for their place in society and the possessions they own. Following this logic, Ukraine women are no strangers to hard work and often have strong career ambitions. They are independent individuals and have clear goals, even from a young age. Despite this, they show willingness to put their professional lives on hold for the sake of their families, especially when they bear their own children. This further ties in with their close family ties. Ukraine women are known for being family oriented, which means that they will usually place their family at the center of their lives, above all else. Blood is thicker than water they say, and Ukrainians are people who value the relationships they share with their family members. The prominent existence of this value is mostly ascribed to their strong religious belief as well. Moreover, Ukrainian ladies are devoutly religious, which can be observed even in modern day Ukraine. Majority of the people within the country practice Christianity, which has been present since the 10th century. Due to this, you can expect your Ukraine bride to pass down these beliefs to your future children, together with the values that go along with it as well. Register today and get the chance to meet marriage-minded Ukraine women when you join our singles tours! Western women are notorious for being highly liberated and will often neglect to take into account the opinions and values of their family members, in favor of their own personal preferences. On the contrary, Ukraine women seeking marriage always consult their parents and the elders in their families first, before making such a huge life-altering decision. Due to this, there is a need for you to acquire their approval first, before you can expect to receive their blessings. Furthermore, your Ukraine bride will most probably want you to consider or entertain the requests and opinions of her relatives too. If you enjoy watching reality shows or reading blogs that focus on western weddings, one observation you’ve probably made is how expensive these celebrations are. Western ladies usually prefer to hire professional event planning services, which normally includes a steep price. Other expenses include the rental fee for the chosen venue, entertainment, catering, the attires, and the list goes on. Ukrainian weddings on the other hand, are simple and cost-effective. Ukrainian ladies are modest and prefer simple ceremonies, as opposed to an unreasonable and lavish one. Aside from all this, a Ukraine bride will traditionally wish to take part in the entire planning process. They are more than happy with taking care of everything, from finding the perfect wedding dress, enlisting the appropriate entertainment for the reception, and even taste testing some pastries and dishes to serve the guests as well. Following this trail of thought, there is no longer a need to enlist a wedding planner, especially considering that it is likely that her family members are more than willing to lend a helping hand too. After you have proposed to your Ukraine bride, the next step is taking the time to visit her parents’ house. During your visit, you must present the ransom to her family, in order for you to acquire their approval and blessing. The practice is referred to by the locals as “paying the ransom” and requires that you provide equal compensation for their daughter. If her parents find your offer to be sufficient, they will bring out the bride dressed in a veil. Otherwise, the lady they present is another member of the family, which means that you must offer something of higher value instead. During the wedding ceremony, a Rushynk is prepared, which usually contains the color red. The shade is often interpreted as the color of life, and represents the sun, good health, and fertility. After voicing out your vows to one another, both of you are to step on the cloth. Ukraine marriage culture dictates that the first person to step on it is usually the one who will wear the pants in the relationship. Traditionally, the Ukraine bride allows her husband to step on it first, to express her respect and affection towards him. It should be noted that your bride and her family will most likely prefer a Korovai cake instead of the usual wedding cake served during receptions. The Korovai is the Ukrainian equivalent to this pastry and is made up of a huge braided piece of bread that contains wheat flour. While it varies from one wedding to another, it can contain traditional Ukrainian symbols and even figurines that are usually handed over from relatives. These items are thought to represent their blessings and wishes for the couple. As what you can probably amass, Ukrainian ladies are one of the best partners that a man can have for a lifetime. When you take the time and put in the effort to truly get to know one to build a relationship together, you can expect your marriage to last. If you wish to learn more about how to meet women in Ukraine and how our matchmaker services work, register today and avail of our numerous esteemed services! Registration is free of charge.